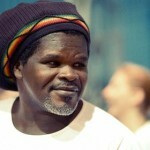 Jorge Egidio dos Santos, known in the Capoeira world as Mestre Jogo de Dentro is the founder of Group “Semente do jogo de Angola”. The Mestre started his way in Capoeira in 1982 as a student at Mestre Joao Pequeno’s academy in the fort of Santo Antonio in the city of Salvador, Bahia. The Mestre received his nickname Jogo de Dentro (inside game) from Mestre Joao Grande due to his style of playing Capoeira. In 1986 Mestre Joao Pequeno passed to him the responsibility of the classes and the rodas in his academy during his absence, and in 1990 gave him the title of contra mestre as a recognition for his work with Capoeira Angola. During that time he replaced Mestre Joao Grande, as he left for the USA, and the group he led got the name “Heranca de Pastinha” (Pastinha’s heritage) and after some changes got the name “Semente do jogo de Angola” (seed of the angola game). In 1994 Mestre Joao Pequeno gave his devoted disciple the title of Mestre de Capoeira Angola. In 1996 he left Bahia to the state of Sao Paulo to continue expanding his work with Capoeira angola, where he stayed for 12 years. In 2007 he returned to salvador and took back the responsibilities with the group there and in the suburbs. Today The Mestre manage his work around the world and just finished record his fifth CD.